Multiple Anemones in a tank? | Saltwaterfish.com Forums for Fish Lovers! I have a RBT and would like another anemone. Can I add a Heteractis or a Sebae without them fighting, or do I have to stay with Bubble Tips? The Tank is a 90 Gal. It is not advisable to mix species within the same tank. (not fighting but chemical warfare) For variety you could go with a different color bta. 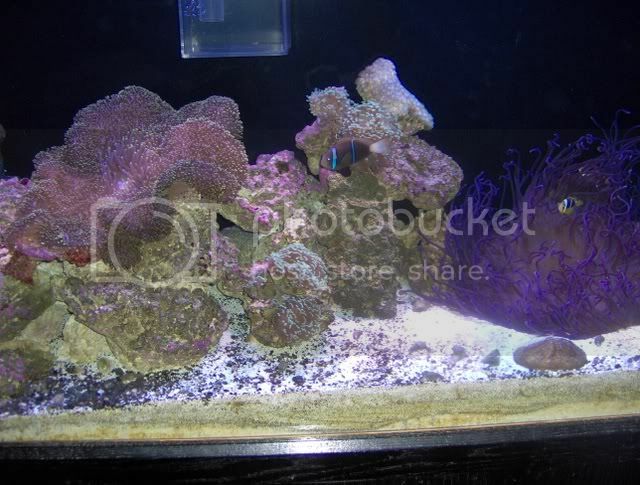 I have a purple m.doreensis and a s.mertensii in my 120g. The trick is to have a carbon filter of some sort. I have a marineland 350 canister filter filled with carbon connected to my tank. If you can find a healthy sebae (tightly closed mouth, not white, and is very sticky.) I think it would be ok to add it to a 90g tank with a bta if you run carbon. Experts recomend not mixing species in tanks under 1000 gallons. They release toxins to attack each other as they compete for space on the reef. In a smaller closed system these toxins build up over time. Sometimes the anemones will build up tolerance to each other but more often one or both will succome to the toxins. They say dilution is the soultion. windlasher may be a successful case of keeping multiple species together. I would also worry how this will effect the other life in my tank. Just a little food for thought. Take it for what it's worth. IME they are doing quite well together. They have been in the same tank since 9/26/08. The mertensii grew from 8" to 18" and the doreensis 12" to 16". What!?!?!? Is this true? I have never heard or read anywhere that you can only have ONE anemone per tank! I'm a newbie, but you would think I would have read that SOMEWHERE in the past 6 months or at least seen some indication of it before. I had NO IDEA you were supposed to choose ONE anemone and have that be your only one per tank.... that's very distressing! 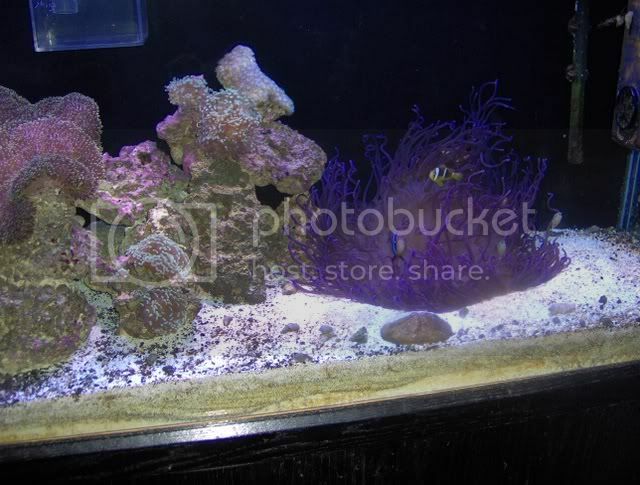 I have a 55 gallon that I had put a pink-tip in (purchased from this site) and the other day at a LFS I asked for an anemone that might be cooperative about hosting a gold-stripe maroon clown because the clown was harrassing the pink-tip so much. They told me a BTA was my best bet so I bought it and put it in the same tank with the pink tip. What signs of trouble should I watch our for? I'm so upset - I was hoping to start getting into anemones - they are so cool! If my anemones stopped growing and one of them died. Then I would believe the "experts" but so far, they are wrong. My anemones are still growing and their colors are fantastic. Sue, I think your anemones will be ok in the same tank. Just don't let them touch each other and have a carbon filter. sea nacl h2o, you do make a good arguement, I would keep doing what you are doing if it's working for you but.. It is a fact that while some are successful many are lost to allopathy. It is better to be informed and know the potential dangers than to just state that the "experts are wrong". I wouldn't suggest Sue remove one immediately, just be aware of the potential problems down the road. If a problem arises in the future you are armed with this knowledge and will be able to act approprietly. 2 MH each one is 150 watts , 1 actinic blue 40 watts. I take off the glass cover) and I will place the anemones near the surface. Can I keep them? Oh crap....... I think I may see a problem here already. My clownfish (the gold-stripe maroon that was nagging the pink tip anemone that caused me to buy it a BTA) died yesterday. The day before he was fine, for months he's been fine, but yesterday he left the anemone and was hanging in a corner by himself with his fins clamped. A few hours later, he was dead. Can we maybe assume that while he was nuzzling into the anemone it was releasing toxins? Here's another "uh oh". My yellow tang has a streak of blood in the dorsal fin and a spot of blood at the base of her body (where the tail starts). I noticed that at lunch today and she's always been healthy as a horse, too. I imagine if the anemones are producing toxins to hurt each other, these same toxins can and probably do hurt fish too, right? You can continue believing who you call experts. I have been to the WWM site a few times. They aren't always correct on all the information they provide. Is there years of research that can prove that mixed species of anemones cannot live in the same aquarium? No, I believe you have a different problem Sue. I hope you're right, or maybe I don't, not sure what I'm hoping! It's bad enough when we see a fish starting to get sick but to not know why or how to help is so frustrating! Besides, I will have to pretty much tear the tank apart to get at the foot of one of these anemones - they are not easy to get at. Ugh. I've seen different anemones in the same tank at fish stores, either they know which ones can live together or they don't realize it's a problem. I may have to ask the manager next time I'm there. I agree 100%. I have a lot of respect for a some of the crew at WWM but have also read a lot of stuff that I disagree with, and some that has been proven wrong (but not quite as much as the rose anemone site). I am not sure what to think about aleopathy in this case. 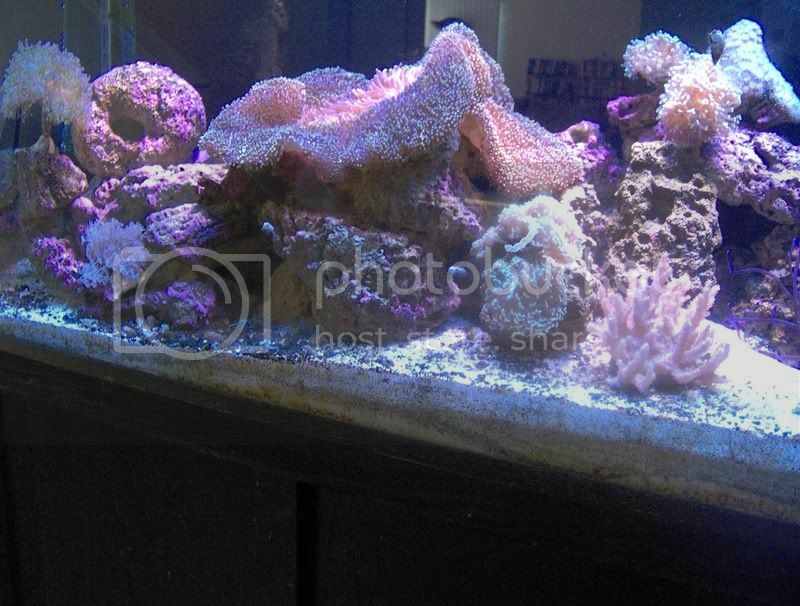 I dont recommend multiple anemones in one tank, but I dont think its as critical as some would have us believe. I keep different species in the same systems (different tanks connected with a common sump). I do run carbon(usually) The anemones I am fortunate enough to keep are considered to be some of the hardest to keep happy. I have a gigantea that is 15 years with me, that shares a system with a 7 year BTA, a 4 year magnifica, a 4 year gigantea and a 2 year magnifica, and an S. hadoni also used to be in that system. Another system contains A bunch of BTAs , a magnifica, a mertensi and receintly moved my 15 year gigantea to that system. I have a long tenticale, 2 RBTAs and a green BTA. I also have a small baby RBTA (that came out of nowhere) along with 2 tube anemones (mated pairs of 2 Midnight, 2 Snowflake, 2 Wyoming Whites, 1 black, 1 orange...Oscellarius Clownfish that host them). I have NO PROBLEMS. I have a lime green carpet anemone in my refuge with two hosting Spoticula Clownfish. I think the trick was that I also have a Fluval FX4 canister filled with nothing but carbon and phosphate remover. Excuse the color from my grow light.